Google AdSense is undoubtedly one of the best way to Make Money Online from your website. But many of the bloggers & webmasters could not make most from their website because either they are not able to get approval from AdSense or their account got disabled. There is no other ad network that can match the AdSense earnings. I have tested many other network with or without AdSense on many of my blogs but even the best ad network did not make me even 50% earnings that I could make with AdSense. One of the strict AdSense policy says that you can not apply to AdSense if your domain name is not 6 months old. Many of the new bloggers who start their blog & work hard to bring the traffic on their website had to wait until there domain age becomes more than 6 months. So what is the solutions for the people who genuinely want to make money from Google AdSense? How can they get an AdSense account? I am going to describe here 3 of the best methods which still works to get approval from Google AdSense. I have tested these methods for many of the people who deserve to get an AdSense account & found success rate of more than 90%. So just check what are these methods that you can use to get approval from AdSense. Before I want to share these 3 methods, I strongly recommend you, not to purchase AdSense account from anywhere because I know such account does not have a life of more than 15 days. With in next 2 weeks, you will get an email from Google saying your AdSense account is deactivated. After you contact these people, either they will not reply you or they will blame on you for this deactivation. These AdSense account sellers use the black hat method to create the AdSense account & once Google knows it, he deactivates the account. 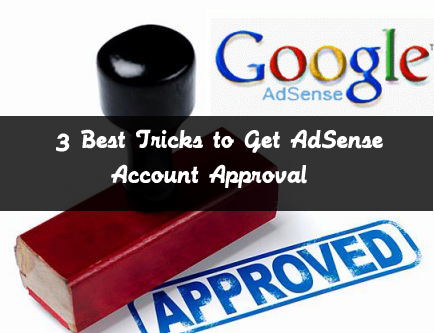 So instead of going this way, use these tested methods to get AdSense account approval. This is one of my favorite method to get AdSense approval. This still works best. Many of the people who does not get approval know about this method. But what they don’t know is how this method works. Most of the people who try to get AdSense approval through this method will upload 1-2 low quality article on revenue sharing websites & then they submit this website to AdSense. In next 2-3 days, they get a sorry email from Google. There are many revenue sharing websites like HubPages, Squidoo, Indyarocks etc. AdSense account is your gold mine so you have to take some pain to get the approval from this. Choose any of the site say ‘HubPages’. Now you need to write well keyword researched articles on this website that is easy to get rank in search engines. Write at least 5-10 articles in this fashion so that you will get traffic as well as authority on this website. Now, you are able to submit your website to AdSense. In most cases, you will get the approval in first attempt. In rare case, if you don’t get the approval, write more high quality articles on your website & then again resubmit. This time, you will get the approval. This is another best way to get approval from AdSense. The best thing about BlogSpot is that you can apply to AdSense account from your blogger account itself. But as most of the spam people try to get advantage of this method, Google has become strict for this method too. But with one tweak, you can use this method effectively. What you have to do here is buy a domain name from Blogger domain service. And then instead of using Blogspot.com to publish your contents, use this custom domain to publish your contents. Now again, you have to publish well researched high quality articles on this blog. Write at least 5-10 articles using this method before applying to AdSense account. After you start getting some traffic, you can think of applying to AdSense. I am sure, you will get your approval in 1 or 2 attempts. Now Google says, you need to have 6 months old domain to apply for AdSense but as you are a beginner & started your blog 1-2 months back, you are not eligible for applying to AdSense account from this blog. Instead of using this blog for approval, what you can do is buy an another old domain. Daily hundreds of thousands of domains get expired due to either owner don’t want to renew that domain or they have no money to pay domain renewal charges. You can buy such domains from the domain auction marketplaces like SEDO, GoDaddy etc. I am not talking here to buy some premium type of domains or the domains with Pagerank or traffic. You can buy any expired domain which is more than 1 year old. You will find thousands of such domains no one interested in & you can buy it for as low as $10. Its good if you manage to buy a domain with some Pagerank & backlinks but if not, there is no problem. After buying the domain, install WordPress on this. Choose one of the decent theme for your blog & then install essentials plugins like Google XML Sitemap, JetPack, Contact Form etc. Now repeat the same thing like writing high quality articles on your blog & then apply to AdSense account. You must get the approval in the first try itself. If not, write more contents & reapply again after a week. You must get your AdSense account approval now. I am sure you will get your account with these methods as I have tested them with many of my blog reader & they got success with at least one method. As you can see, I have emphasized on quality of articles in all the methods, you have to keep this in mind. Google value original contents more than anything else. This is a Guest Article written by a Guest Author Of blogtipsntricks.com. Also See How To Become a guest author on BlogTipsNTricks. How much days i have to wait or else how much traffic (min)i need to apply adsense account.. Your blog must have atleast six month old and It will be getting a traffic of about 100 pageviewes per day Is enough for approval. You have to wait atleast 4days after applying, then you will get a reply mail from Google. my blog has been online for over one year, and almost every post i write are original my own articles. i have more than 250 posts there. My site traffic is not low, almost 50.000 unique visitors a month. And I use blogger and custom domain too (not .blogspot anymore). I have registered over 20 times and always rejected! please help me what i have to do? my site is www.linuxku.com. Can I use adsense from youtube to other sites or at least blogspot? How can i get adsense?